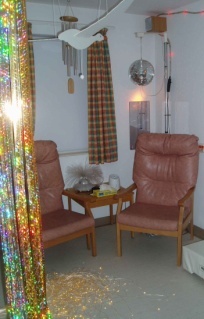 Sensory rooms began as comforting and/or stimulating spaces for people with profound and multiple learning disabilities but, happily, are becoming increasingly popular for other patients needing a gentle, calming environment. And now that seclusion rooms are, fortunately, being phased out of most wards, sensory rooms are a much more humane and soothing alternative. Some are called de-escalation rooms, or the more mainstream chill-out or quiet room. Other nice terms include Zen room, Chillville, serenity room and comfort room, all of which reinforce the benefits of this calming space. 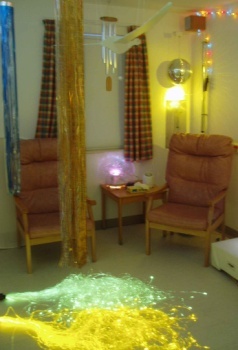 Furniture and design features which support a tailored, healing sensory experience include beanbag or rocking chairs, gentle and natural lighting with perhaps mesmerising fibre-optic features, lava lamps, multi-media centre which can be controlled by the patient or staff, comfy blankets. All very lovely. Unlike seclusion rooms. The name’s the giveaway. The entrance lobby should provide a secure entry for three to four staff as the patient is likely to be struggling. (Curren et al, 2005). This is a chilling vision. An acutely distressed person fighting not to be locked in the equivalent of a padded cell. Yikes! We’ll come right out with it. We really, really don’t like seclusion rooms. Seriously don’t like the brutal honesty of the name, but even more so the whole concept. Leaving aside for 30 seconds the issue of how dangerous some patients can be when very ill, it is impossible to regard the room as anything other than a punishment cell. The priority has to be not just adequate but excellent levels of training for staff, to support the highly skilled task of defusing volatile situations. They’re not essential. Half of the 136 participating wards in City University’s meticulous research had no access to a seclusion room. We don’t buy into the whole ‘low-stimulus’ for every single person, every single minute of their time locked in the room approach. Black men are considerably more likely to be subject to seclusion – being locked away in a room by themselves. (Count me in 2010). There are cruel, long-lasting effects. Being locked up in an unpadded cell couldn’t be less compatible with building a therapeutic alliance with staff, especially if getting the patient into the room involved a ‘struggle’. There remains widespread concern about the use of seclusion, particularly for long periods of time, and it has been suggested that there be a statutory prohibition of its use (DoH 1992). The RCN believes that seclusion is an anti-therapeutic intervention that will ultimately become redundant (RCN 1992). They can recreate and reignite past traumatic and abusive experiences and this can make even civil let alone therapeutic relationships with staff extremely difficult. It can’t be confused with a punishment cell. When it is used, the other patients on the ward, as well as the patient subject to it, should be debriefed afterwards. No member of staff can be involved in secluding someone until they have spent 2 hours alone in seclusion room. Flying/instant response squad included OTs, psychologists, independent crisis advocates. There were financial bonuses for not using seclusion rooms and/or penalties for using them. “We don’t use seclusion on a regular basis and prefer to use ‘de-escalation skills’. The new wards that been renovated at our Trust do not have seclusion rooms – instead, they have ‘low stimulation rooms and areas’ that can be sectioned off from the rest of the ward – that aren’t ‘secluding’ or ‘isolating’, but allow staff to work with / manage the risks”. The ward has a room that provides tranquillity and relaxation during times of distress. Patients have helped decorate this room. The large main room is primarily a lounge but has a bed if the patient needs to sleep overnight there. (Also bathroom and loo.) Staff and patients bring books, games, crosswords, and when the patient is sufficiently settled, a radio. A seclusion room is at the suite entrance but is rarely used. There are always 2 staff with a patient in the de-escalation suite and patients usually spend a very short time in there, eg half an hour but one patient needed to be nursed there for 2 weeks and then had careful, phased return to his bedroom and the rest of ward. A de-escalation room with resources for self-soothing including ‘care bags’ which appeal to the senses of sight, touch and smell. The room includes a rocker, light projection and body-sized bean bags. An ‘Intensive Care Area’ (ICA) – a lockable, self-contained, closely supervised living space, allowing safe containment and high levels of individual freedom for the patient – has proven to be a therapeutic alternative (Kinsella et al 1993). It is costly in terms of staff, requiring a two person nursing team (changed every hour) to be in constant contact with the patient. A wall-mounted plasma screen, DVD player, phone and music system within the seclusion area. Secluding a patient is an extremely frightening experience for them. Therefore consideration should be given to placing certain key information to help explain events to him/her whilst in seclusion, for example, information printed in a very large font across the wall in the seclusion room. This could include information such as the name of the ward and hospital, other basic statements to reassure the patient, e.g. that they are safe, in hospital and what to do if they wish to summon assistance or talk to staff. Videolink or intercom so that staff and patient (and other patients, carers etc) can talk during seclusion. The relaxation room is very lovely and modern in a distinctly IKEA way, with music and a library. ‘The Zone’ is a chill-out space developed in consultation with patients. ‘The Sanctuary’ is a relaxation room. The window has a water photo transposed on it. There’s also a blind for night with a night-time version of the photo! The ceiling has fibre-optic lights, which change colours gently. Sounds and visuals can be personalised. One wall includes glass brick cubes. Sensory room. Patients can have a ‘sound bath’. Sometimes I used to go to the big library when I had leave. It was just so peaceful and comforting. I just had to be with other patients and the staff, otherwise I felt isolated and got quite panicky. I even liked sharing a dormitory and could put up with the snoring because I felt safer being with others. I would go to the quiet room if I felt threatened by a patient who was agitatated or getting aggressive. The staff understand and help explain to other patients when I need my own space because I feel overwhelmed by everything. There was always an area where we could just relax, take a breath and escape for a little while. Only two people were allowed in it at a time which helped protect its purpose. I often get angry with those I am closest too. It’s great that we have a space on the ward to just relax, my relationships are definitely benefitting from it. When I was recently in hospital, my ward had been the PICU, so was lumbered with a prison wire fence around the garden and two seclusion rooms. My sister who has stoically coped with deeply distressing aspects of my illness, found that coming onto the ward and walking down the corridor past the two metal doors with post-box slats had been so shocking it had made her cry. The impact of having seclusion rooms on other patients, visitors and staff can’t be underestimated. The practice of seclusion and time-out on English acute psychiatric wards: the City-128 Study. Seclusion is widely used internationally to manage disturbed behavior by psychiatric patients, although many countries are seeking to reduce or eliminate this practice. Time-out has been little described and almost completely unstudied. To assess the relationship of seclusion and time-out to conflict behaviors, the use of containment methods, service environment, physical environment, patient routines, staff characteristics, and staff group variables. Data from a multivariate cross-sectional study of 136 acute psychiatric wards in England were used to conduct this analysis. Seclusion is used infrequently on English acute psychiatric wards (0.05 incidents per day), whereas time-out use was more frequent (0.31 incidents per day). Usage of seclusion was strongly associated with the availability of a seclusion room. Seclusion was associated with aggression, alcohol use, absconding, and medication refusal, whereas time-out was associated with these and other more minor conflict behaviors. Both were associated with the giving of “as required” medication, coerced intramuscular medication, and manual restraint. Relationships with exit security for the ward were also found. Given its low usage rate, the scope for seclusion reduction in English acute psychiatry may be small. Seclusion reduction initiatives need to take a wider range of factors into account. Some substitution of seclusion with time-out may be possible, but a rigorous trial is required to establish this. The safety of intoxicated patients in seclusion requires more attention. This is a superb article and approach. Click here to read the whole excellent piece. Sensory Rooms are being incorporated into restraint reduction initiatives. Many Sensory Rooms are being used for crisis de-escalation and also crisis prevention as patients learn safer and healthier ways to regain self control. The Sensory Room serves as a quiet, safe, and respectful place of retreat that is much more supportive than rooms for seclusion that deprive the senses and invite disorientation. In the Sensory Room sensory supplies and activities are available to help a patient calm down and avert crisis; the locus of control shifts from staff intervention to personal responsibility for self-regulation. Patients’ perceptions of seclusion: a qualitative investigation. Inpatients had mostly negative experiences of seclusion during short term treatment in a mental health facility. Patients often made suggestions about putting items such as paintings in the seclusion room to help them to cope with the boredom and isolation. Patients used various strategies to help them to maintain control while in seclusion eg talking to themselves to break the silence. Patients reported that staff communication during and after the seclusion period would have been helpful and expressed the need for a debriefing period after seclusion. Patients felt that they lost claim to any individuality or rights once they were in seclusion. They requested being better informed about rules and consequences and expectations that would lead to the termination of seclusion.